I am very happy to be offering this paper share in July whilst we have a Buy 3 Get 1 Free paper sale on! This means I can pass the savings on to you! The Designer Series Paper in the new Annual Stamping Up Catalogue are just beautiful and are perfect for card making, scrap booking pages, tags, boxes, bags and all your paper craft projects. Have you ever looked at all the different patterned papers and wanted to try them out? Maybe there are so many to choose from you can't decide. Maybe you buy papers and can't bring yourself to cut into them or perhaps you always end up with a lot left over and now some more pretty papers have caught your eye? -We have all been there! I have a solution for you in the form of a paper share. Each pack of 12 x 12 papers when ordered in its original state has 12 sheets. Two each of 6 double sided designs. I am offering a quarter share of each of the above 4 collections equalling the same amount of papers as one full pack of one collection. That includes one sheet of each design in 6 x12 inches . this means you will get to try out all the papers in all four packs but at a fraction of the cost as it is a share! The same principle applies to the 6 x 6 inch packs. You would receive one sheet of each design from all four packs - a quarter share of each. More simply put, you receive some of all of the papers, but the same cost and quantity of paper as one whole pack. This is a brilliant way of trying all of the paper designs for a fraction of the cost and also reduces hoarding too! Win Win! Once I have a minimum of four people wanting to partake in a paper share, and payment is received the order is placed. Once they have arrived with me I divide and repackage the papers and send them straight to you with a small additional postage charge. If you live locally and are able to collect there is no additional postage charge. I am very excited to be offering a paper share of these 4 collections from the range of Designer series papers! This is Paper Share 1. I am offering a Paper Share of these 4 collections from the range too. This is Paper Share 2. If you would like to partake in my July Paper Share do let know. There is no limit to the number of shares you can buy or if you would like full packs at normal price or take advantage of Buy 3 Get One Free you can do that too! You can contact me via my email here or just drop me a message. You can pay via Paypal, bank transfer or cash. I package it up and get it out to you as soon as possible. Usually within a couple of days of me receiving the shipment from Stampin up. We have another AMAZING offer this month too! July Free Ink Pad Offer!!! 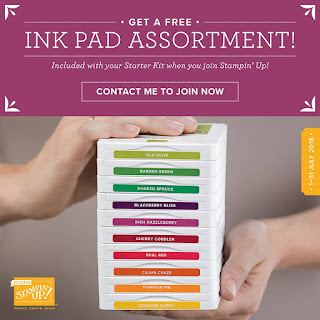 If you love ink, stamps and paper and would like to build your stash, Stampin' Up! have an AMAZING offer this July starting Sunday July 1st! I am so excited about this! You can read all about it in my blog post here.Contact me for details! This offer is amazing! I do hope you will be tempted to take advantage of it! Join Stampin' Up! and choose any £130 of products to go in your starter kit, plus during the month of July a whole Colour Family of Ink pads of your choosing, plus free shipping all for £99! There is no risk involved, there is lots of support if you wish to take it as a business opportunity but also no obligation to sell or demonstrate if you choose not to WIN WIN! I would love to have you on my team. See my FAQ's page at the top of the post or contact me for further information or a no obligation chat if you prefer. July Just keeps on giving! !